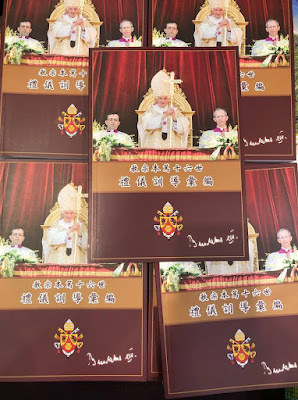 We are pleased to present a Chinese reader’s translation of the address given by Joseph Cardinal Zen, Bishop Emeritus of Hong Kong, on the occasion of the presentation of the Chinese edition of Pope Benedict XVI’s Collected Works: Theology of the Liturgy. The address was delivered as a video message posted on the Hong Kong page of the Salesians of Don Bosco (SDB-CIN) on July 29th, 2018. The text is being posted simultaneously on Canticum Salomonis. I had planned to introduce this book to you on the occasion of the Hong Kong Book Fair, and it would have been worthwhile to take this opportunity, but unfortunately I am suddenly called away for work and have to leave Hong Kong, but I still want to share some words with you. Pope Benedict is a great pope, and the greatest thing about him is his theology. He is a theologian, and not only a theologian, but a master of the spiritual life. What is the difference between theology and spirituality? Theology is about the ways revealed by God; the spiritual life is living in accord with the ways God and Jesus have taught us. One of the very important elements of the spiritual life is the liturgy. We all try to live our faith in our lives, but some saints excel over all others, and we call them mystics. These people have a very direct experience of God, and their mind is caught up ecstatically in the Spirit. [Mystical experience] is not reasonable, but this does not mean it is unreasonable. Rather, it surpasses reason. We have been blessed to see Pope Benedict many times and we can learn the spiritual life from him. So we thank God that this pope has been with us for many years and is with us even now. He is living by himself in a tiny hermitage, and he is still there praying for us. I will take a few examples at random from this very rich book. One of the very important things is that he returns to first principles. Our contemporary Catholics live in a new age, in the age of Vatican II. The aim of the Second Vatican Council was reform, but reform can be misunderstood very easily. Reform brings new things of course, but it is not equal to throwing away or abandoning the old. Rather, sometimes reform means returning to the origin of things. So this reform has to be understood accurately. The teachings of Pope Benedict can lead us to the true spirit of the liturgy, the real reform called for by the Council. It is easy for us to focus on what we see, because our attention is drawn to what we see. But what we Catholics see is very special, something it is not enough to look at superficially. We have to see the real quality inside it. This requires us to make great efforts, since liturgy is not something we can understand superficially. Vatican II was not accomplished in one day: it was prepared by many qualified theologians and experts of liturgy. Consequently, we have to follow the pope back to the real spirit of the reform. The spirit of the reform means more than celebrating the liturgy in the vernacular. Of course it is good to use the vernacular. It is not wrong. It is an important part of the reform. But this is not the most important thing. Whatever language is used, the most important thing is the integration of the human spirit with God. When you hear the pope’s teaching it is as if you leave the visible world behind and rise with him into the presence of God. Liturgy is a very important activity in the Church. The Church gave an excellent definition of liturgy at the Council, when she taught that the Church herself is a sacrament. At that time some people were surprised: We have seven sacraments, why do we need an eighth? But it doesn’t mean that. A sacrament is visible thing that helps us to understand invisible things. Because there are invisible things, so Jesus helped us use visible things to understand the invisible. Liturgy is completely in accord with this theology of sacraments: all things that can be seen in the Church. But we cannot stop there. We need a deeper meaning of their true meaning. Therefore, the liturgical reform of the Council does not mean only the use of vernacular languages, or a mere change in ritual, or that some actions are different. The most important thing is to help us encounter God, because God is invisible. Liturgy makes it easy for us to encounter him, giving us a deeper understanding of our faith and allowing him to be part of our life. In this book, the pope has given us many wonderful teachings. For example, in the sermons he gave when he consecrated churches, he preaches many different things that help us understand what kind of place the church is, and what we should pay attention to in the church. Sometimes, it is a pity... People know the pope wrote several articles about the ad orientem posture, about praying toward the East. Now the liturgy permits the priest to face the congregation to celebrate the Mass. But what the pope actually suggested was that we can face the Cross together, face the back of the Church, because the great churches of ancient times had a great mosaic of Jesus in the back of the church. In this way, we go together back to God. 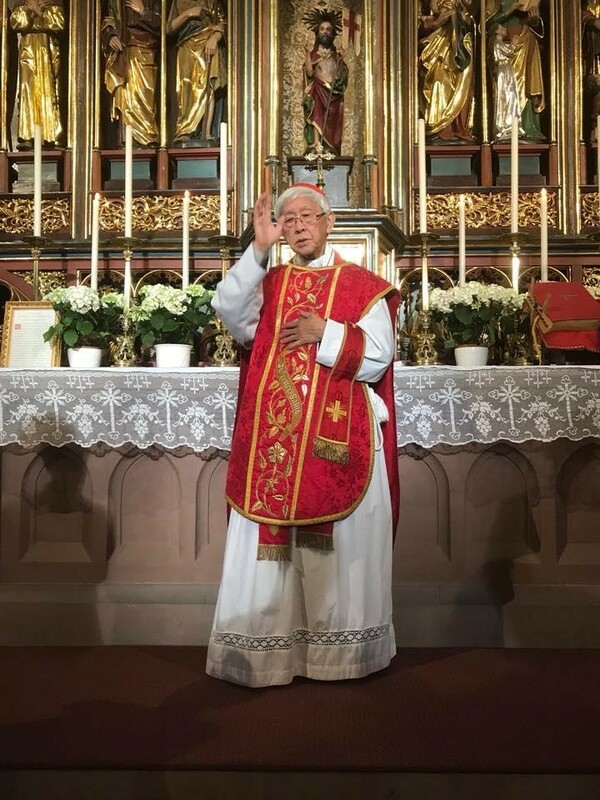 Cardinal Zen celebrating Mass at the church of Mary, Help of Christians, in Hong Kong, Christmas 2016. So the church building itself is also a sacrament. A church is a visible building, and its architecture can lead us up to the heavenly Jerusalem. Because we are in this world, the church is built with the precious materials of the universe. There are stones, wood, metals, and these things take up nature into the place where we worship God. These are things we can see. But we have to understand the deeper reality that the church is the symbol of God’s presence with us. The architects arranged these earthly materials so that they elevate our whole spirit toward God. If we visit the great churches of Rome and other famous basilicas of the world, especially the ancient basilicas, we can understand how the ancient people entered the church: they saw an architectural review of the whole faith, because in the church there are many things that help us to remember the contents of the faith. Of course, in history there are many artistic styles of church architecture, all expressing rich and colorful spiritual attitudes. But the most important thing they do is allow us to understand that in this house we are one family. The liturgical reform has emphasized the fact that we are one family gathering in the church. Jesus instituted the sacrament of the Eucharist at the Last Supper. We eat his flesh, drink his blood, and this meal aspect is significant because the family usually gathers together for the meal. But the Mass is not only taking a meal. The Mass is a special meal, the Paschal meal, a holy meal that Jesus transformed when he said “This is my Body, take and eat.” This flesh is also an offering, and this makes the Mass a holy sacrifice. So in every moment we have to keep this spirit of veneration and worship in liturgy. Modern people especially need this. In the ancient church, in European countries with a Christian culture, it is very easy to remember God. The countryside is strewn with crosses and statues of Mary and the saints, and every city has many churches. All this makes remembering easy. But this is not the case in modern cities. Now people don’t have so many opportunities to remember God. In the church we have to reinforce the principle that the basis of society is Jesus who became incarnate for us, suffered for us, died and rose again. Liturgy is sacred. When the Church educates the clergy, its chief purpose is not merely to teach them the ritual, because this very easy, but to teach them the spirit of worship. The pope has used many wonderful words to express this. He said that in the Church Jesus captures us and unites us with him. We so need to be captured by Jesus, because contemporary society can’t help us to return to Jesus. Only when we make an effort to truly encounter Jesus in the liturgy can we bring Jesus to others. The pope expresses this thought repeatedly. It has been many years since the liturgical reform, and the pope is highly qualified to evaluate its results. Perhaps many Catholics feel that the reform was good. Indeed, after the Council the most conspicuous change is the reform of the liturgy. But perhaps the reform has remained on the surface of things. We hope that studying the thoughts of this pope will lead us to a more profound understanding, so that in the liturgy, in all its chants, actions, and other visible things, we can have a deeper encounter with the presence of the Holy God. One of the things we have to pay attention to is that liturgical reform does not mean abandoning the past. Sometimes, on the contrary, it leads us precisely back to the root, the origin, to its real significance, to the Bible, to the documents of the Council. After the Council ended, the liturgical reform was implemented later on by...certain people--who of course deserve credit for their many efforts--but it is time for the Church to evaluate this liturgical reform, asking whether it completely, faithfully expresses the expectations of the global gathering of bishops at the Council. How to evaluate it? First, it means reading the council documents, Sacrosanctum Concilium, and looking at the work we are doing now. Obviously, the Church didn’t begin at the Council, so many experts were very clear about the liturgical tradition. In the Council, it is very clear that, simultaneously with reform, we must preserve the very precious traditions of the Church. This requires hard work. Certainly, not everyone has access to Latin or studies Latin. 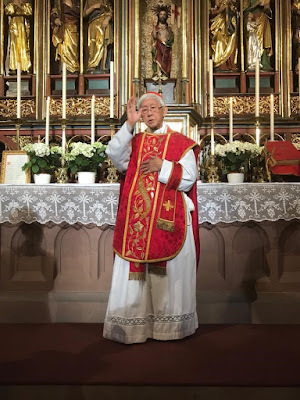 But there should be some people in the Church who especially study and evaluate whether the liturgical reform attained the goals pointed out by the bishops of the council. 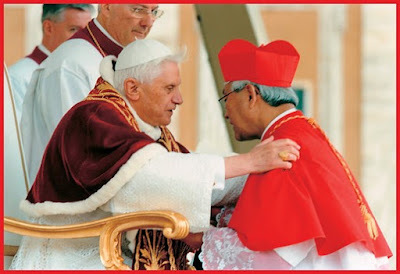 Pope Benedict represents the true spirit of the Council. On the one hand, if we go back to read Sacrosanctum Concilium, and at the same time read the very rich teaching of the Pope, it surely will lead us to the authentic spirit of the liturgy. On the other hand, [this true spirit] incorporates the long history of the Church: the saints and martyrs who used the liturgy of their time to lay the good foundations of their faith, and even sacrificing their lives for God to bring the Church to every corner of the world, and the missionaries brought the liturgy to every place where they evangelized. These things are the basis of the liturgical reform, on which to build the contemporary Church in the modern society. So, on the one hand the Church needs to absorb the interests and tendencies of modern people, since every age has its strengths, but it has to be very careful to avoid the false ideas prevalent in modern society, such as secular or relativist ideas. So we absolutely cannot suppose that reform means taking the present day as an absolute starting point. Perhaps some people were surprised when the Pope said that the Tridentine Mass is still a form that can be used by the Church. But if you participate in it, you will discover that there are many young people there. It is not necessarily only on account of old people who are nostalgic for the past that we began to offer this form of Mass. Many young people have come to relish the old rite. As I said earlier, in the liturgy there are things that surpass reason, things that can be felt but not expressed. Sometimes, perhaps, these precious things are easily lost in our modern liturgy. Sometimes we think that only those things clearly explained are helpful to us, but that is not necessarily the case. The Church says we need times of silence. Sometimes we don’t need to sing. Listening to music is also a kind of worship. For example we can use suitable music when we venerate the Eucharist or in personal prayer. This presents a great challenge to us, since every generation has the responsibility to pass on these precious traditions of the Church to the next generation. A generation does not make itself. Of course we know that every grace is granted by God, but the effort of man is not only the effort of his own generation. Each person has his own responsibility for the liturgy, in the society in which he lives, but he can’t bear this responsibility by himself, because liturgy doesn’t start from him. It was born from the Church and runs up to today, passing through Jesus, the Apostles, missionaries, and so many saints. The heritage they left is very precious. I think the pope has fulfilled this task, as you can see in his rich teachings. On many occasions, he takes pains to use his own experience in a very moving way to pass this heritage down to us. Perhaps we think, “he is a theologian, so his words are too complicated.” But that is not the case. He explains things very well. As I said earlier, he describes how Jesus captures us and brings us into himself. In this Book Fair there are many books. I hope Catholics cherish this book, because liturgy is our life. Liturgy is the life of the Church. Liturgy is a very precious thing. The whole Church and the seven sacraments are things we can see. Through these visible, tangible, edible things, we are granted to know what is invisible and intangible. These things rely on the Holy Spirit, who throughout history has stored up many precious instruments for us. If we want to improve the liturgy, we have to read more. The Book Fair encourages us to read and our Catholics really need to read. In our modern culture, perhaps, people don’t have the patience to read written texts, but we must read. We welcome new audio-visual instruments that make it easier to assimilate things, but we have to have close reading of written texts. For example, we have to read the Bible, because the liturgy is full of the Bible. The Bible enables us to understand the liturgy, enables us to absorb all the treasures accumulated in the history of the Church. In addition to the Bible, we also have to read the documents of the Council. Also, we need to read these teachings of the pope. Reading these things will ensure that we are not superficial and passive, because the basic principle of liturgical reform is active participation. Active participation does not mean “the more action the better.” We need to be silent. Active participation means that we need to think to understand to go deeper and to respond. And if we read these teachings of the pope carefully, it will be helpful to us.